Superior Log Hideaway is just a little east of heaven on a small quiet lake in the wild heart of the Superior National Forest, only about 8 miles from the southern boundary of the B.W.C.A. Search far and wide but you will not find many places in Minnesota or the planet that rival the remote tranquility and amazing craftsmanship of this extraordinary log homestead. So remote that access is limited to pulling pulk sleds (6 provided) in the snowy months. A perfect place to commune with nature, reconnect with family and restore your spirit. If you are planning a wild party weekend, please seek different accommodations. Big red and white pines tower overhead, providing nesting habitat for eagles, osprey, owls and kestrels. You are surrounded by 17 acres of tall pines for complete seclusion and privacy. 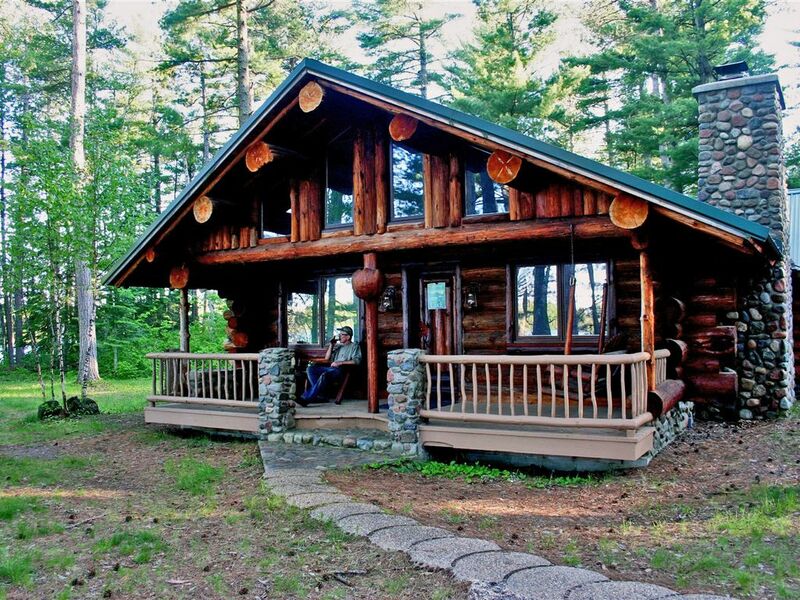 All buildings are full log construction and include the main cabin, sauna and outhouse. There's also a fish cleaning shack, covered BBQ and fire pit for roasting weenies and s'mores. We even throw in 3 CANOES and FIREWOOD. Beautiful handcrafted rustic furnishings add to the cozy up-north atmosphere. The master bedroom features a gas fireplace and the living area boasts a stone wood-burning fireplace. If you are looking for a quiet, secluded wilderness escape, you have found it. Even with a very adequate public boat launch less than a minute away, there is no such thing as 'rush hour' on pristine Lake Gegoka. Speedboats, tubing and jet skis are definitely out of character here. This sparkling clean little 150 acre lake offers fishing, canoeing, swimming and just plain gazing out at. Our 3 complimentary canoes provide a perfect way to explore the lake. The dock, which pokes out into the narrows in front of the cabin, is available to cast your line from or could accommodate your own small fishing boat launched from the public landing across the lake. Lake Gegoka is a shallow sandy bottomed lake and warms up early in the summer. Just a few minutes away is a little used public swimming/picnic area on Flathorn Lake. There is a very scenic hiking trail around it. The woods and lake are beautiful and pristine! My wife and I would love to retire here some day. Shower/tub, toilet and sink. Guests provide their own towels. Beautiful hand crafted log outhouse right out the main cabin back door. View your private 1/4 mile of lake frontage from almost any window in the log home. Use of 3 canoes, paddles and life vests included with rental. Fish and swim from the dock or a boat. Sandy bottom Lake Gegoka. No sand beach, but great swimming off the dock. Use of 3 canoes, paddles and life vests included with rental. Private 1/4 mile of lake frontage on pristine Lake Gegoka. Use of 3 canoes, paddles and life vests included with rental. Fish and swim from the dock or a boat. 30 kilometers of groomed classic cross country ski trails in the pines right out your door. Pristine Lake Gegoka. Use of 3 canoes, paddles and life vests included with rental. Fish and swim from the dock or a boat. Beautiful stone hearth. Wood provided. Relax by the fireplace. Wood provided. DVD player. Small video collection. No TV channels. Bookshelves filled with great books for all ages. Outdoors adventure flicks for all ages and more. 30km groomed classic cross country ski trails. Ski in and out from property. Incredible wood-fired sauna. Wood provided. We spent a late September weekend that was blasted by a cold streak including snow up at the Hideaway. We were warm and cozy in this charming log cabin. If you've ever heard of the Danish term 'hygge', this fit that bill idyllically. Only 2 things that we noticed we would have appreciated: a few more lights/lamps in the main dining room/living room, and a wider stocked kitchen with dishes and cooking equipment. We certainly made due with what was available. Thank you again Superior Lodge for keeping this property in such fabulous shape. Totally unique! Loved the rustic nature of the whole property! Can't wait to return! We really enjoyed our stay & look forward to returning. Wonderful! We will be back!!! Peaceful, clean, and nicely appointed cabin with great outdoor amenities. Thank you, Andy! This is a very uniquely crafted cabin with lots of rustic hand-made furniture, light fixtures, etc. The master bedroom is very nice with it's own gas fireplace. The other sleeping areas are okay. Fan from heater kept one person awake so she moved to basement bedroom which is quite chilly. Wood fireplace in living room is lovely, there are books and games available, and there's a sauna a few feet from front door. Best location you can imagine in MN with the state's finest xc ski trails! Always plenty of snow in winter. My family and I spent three frigid January nights here, and enjoyed every minute of it. We will definitely be back. For those who enjoy nature and being close to it, this is the ideal getaway. In this remote corner of Superior National Forest, wildlife is abundant. Moose roam the area, and on occasion have been seen swimming in our lake. Timber wolves, pine martin, foxes, fishers and many other shy forest creatures are seen and heard. So remote that the cabin is only accessible by pulk sleds (6 provided) in the snowy season. The surrounding area is very sparsely populated and offers many opportunities for exploring. The U.S. Forest Service maintains a number of hiking trails, picnic areas and public accesses to lakes large and small. Day trips to the B.W.C.A. wilderness are also an option.